By utilizing the expertise of creative professionals we’re able to combine function, timeless style and ingenuity to bring new life to your workspace. From the planning stages through to installation, our suite of services will help you achieve your ideal work environment. We strive for levels of service that will exceed all expectations. For more information about what we have to offer, don’t hesitate to contact the team at Commercial Design Control. A well-designed office requires a delicate balance – it needs to encourage productivity, and be a space that’s truly enjoyable to work in. That’s where our experienced consultants and designers come in. 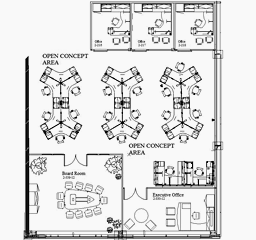 Through assessment of your goals, interviews with your staff, and expert analysis, our consultants can recommend the most effective office layout. Using the latest technology, our design team will create detailed floor plans and 3D renderings, giving you an accurate vision of your new space. Collaborate with our in-house interior designer to ensure your new office projects an image that matches your taste and budget. For every inch of your office – from reception to boardroom – we have an exhaustive range of high quality office furniture designed specifically to enhance your company’s identity and work in harmony with your office environment. And after you’ve handpicked the furnishings you need, our installation team is available to get you set up. Before you know it, the office space you imagined will have come to life before your eyes. Browse our catalogue of office furniture including: workstations, seating, reception options and more. See the products menu above. A quality product deserves a quality installation team. We’ll deliver and set up your new office furniture with minimal disruption to your work, and always precisely on schedule. Let our Physical Services team do all the hard work so you won’t have to even lift a finger. We’re prepared for large scale office relocations right through to reorganization of your existing workspace. We also offer ongoing maintenance so you can keep your office looking its best. Our Physical Services team will oversee the relocation or redesign of your office space with minimal disruption to your business. From asset management/warehousing to delivery and installation, your next move is in expert hands. A well-kept workplace speaks volumes about your business. Our Maintenance Service crew are on call to offer refurbishment, fabric protection and more. 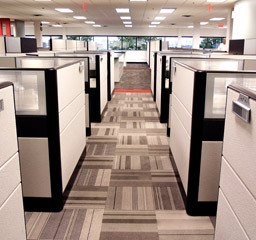 We’ll make sure your workspace is always looking its best. Whatever your office design needs, our talented team is ready to help. Get in touch and find out more about what we have to offer.